These eye catching earrings are anodized electrically to the light blue color that resembles the aquamarine stones, which is the birthstone for people born in March. 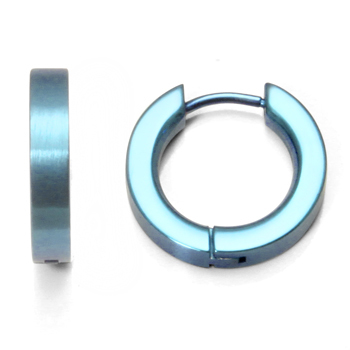 They are extremely light in weigh because they are made from solid CP2 grade titanium alloy. The blue color will not fade or tarnish and you can even wear them to swim in the ocean and pool. Another cool feature for titanium earrings is being hypoallergenic, and will not cause allergic reaction even to the most sensitive skin types.